What is CMMI Maturity Level 2 Documentation? The organizations with CMMI maturity level 2 are those who have achieved all specific and generic goal defined at the maturity level 2 for process requirements, processes, work products, and services with main focus on project management. CMMI level 2 documentation is a list of standard documents required for achieving implementation of CMMI V1.3 development model in software industries. We have designed CMMI level 2 documents with our experience of CMMI level 2 consultancy and requirement of implementation of CMMI for stage maturity level 2 in software and IT industries. The documents are prepared by the consultant with rich experience of process improvement and process enhancement. Many companies are appraised successfully under CMM-Dev V1.3 maturity level 2 with our consultancy. 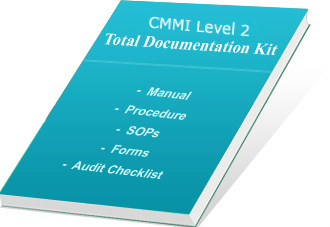 We offer CMMI documentation kit for software companies. CMMI maturity level 2 documents are designed with aim to help software companies in designing swift documentation for CMMI certification for stage 2. Our CMMI Level 2 Documents are globally used documents available with ready-to-use manual, procedures and templates. The complete set of documents is having quick editing features and compatible with clause-wise requirements of CMMI-DEV maturity level 2. The documentation kit is designed to assists CMMI implementation and documentation process. It will guide users to achieve fast and effective implementation for stage 2 CMMI model. We assure that, our packages are competitively priced and completely meet the demands of the CMMI development model V1.3. What Does CMMI level 2 Complete Documentation Kit Offers? Sample CMMI level 2 Manual (12 chapters and 1 Annexes). CMMI level 2 process flow-charts for 8 different phases of the system. Sample copy of CMMI guidelines to train employees for implementation of CMMI level 2 system (10 guidelines). Set of coding standards for best programming practice as per CMMI level 2 requirements. (04 coding standards). CMMI audit checklists and Interview affirmation questions (More than 400 questions). The CMMI level 2 certification documents cover sample copy of CMMI manual, which contains more than 21 pages of word documents, which help users to define their CMMI maturity model effectively. The documentation also covers 24 mandatory procedures for different phases like engineering, project management, process management and support activities. More than 67 sample formats and ready-to-use templates are given within the documentation kit which helps in managing records of the baseline system. Sample guidelines and coding standards will help users to understand CMMI requirements and follow them in daily practices of Software life-cycles. CMMI audit checklists can be used to verify the implemented development model as per CMMI maturity level 2 requirements. Affirmation questions given with CMMI documents will be helpful in preparing owners and management team members for auditing implemented system. The entire CMMI level 2 documentation Kit is available in editable format so it is very easy to edit and format the documents as per your organizational requirement. The CMMI Lvel 2 documents are well-written in simple English and are compatible with Windows 1997 or its higher versions. Users can easily amend and change the templates as per their working system and create own CMMI documents for effective implementation of level 2 development model. Procedures and sample formats provided in document kit can help establish better control over Software life-cycle. Saves much time and cost of document preparation; gives true value for money to customers. Ready-to-use standard documents in .doc format reduce your time in documentation process. It can be a useful tool in the training of staff for learning CMMI development model V1.3 clauses and requirements. Our documentation kit helps users in creating CMMI manual, procedures, SOPs, policy and audit checklists for quick certification. Takes care for all the sections and sub-sections of CMMI-Dev V1.3, gives better confidence as well as improves the system. On successful completion of secured purchase, we provide username and password to download the product from our FTP server. We provide instant online delivery of our product to users by sending them username and password by email. CMMI-Dev V1.3 Level 2 Documentation Kit is available at a very compatible rate and any one can purchase it by secure online transaction with Paypal.com. We are selling our products worldwide by E-delivery. Our documentation products are verified and used in more than 65 countries.